Guinea pigs are tail-less rodents that are native to the west coast of South America and since the mid-1800’s, laboratories have used them for research. The correct name for guinea pigs is Cavy, pronounced “kay-vee”. Guinea pigs usually weigh around 3 ounces at birth, around 1-2 pounds full grown, and live for 5-6 years. An adult will measure 8-10 inches from the tip of its nose to the end of its rump. Their hair comes in a wide range of colors and the hair may be long, short or short and curly. Cavies have a very good sense of smell and sensitive hearing. They love to vocalize with squeals, chirps, squeaks, and whistles. Although not known for their intelligence, they do recognize their owners and will seek them out and return affection. Guinea pigs are cuddly, comical, and clever. They make wonderful pets for children and can be very social animals. The animals do better in pairs as they prefer company, so unless you have a lot of time to devote to your pet getting at least two is often a good idea. They are not expensive to own and the biggest expense is the initial setting up of housing. Guinea pigs are hardy pets so veterinarian expenses are minimal. A list of supplies needed to have a happy and healthy cavy. The foods and supplements necessary for your pet’s diet. All about creating the perfect home for your guinea pig. Keeping your pet healthy and common illnesses and injuries. Breeding, mating, sexing of cavies and the care of babies. 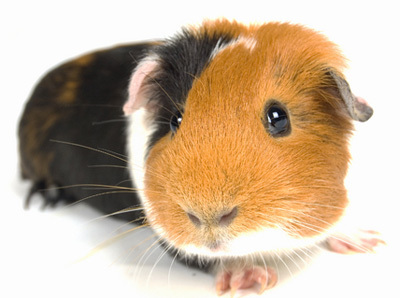 The most common types of guinea pigs available as pets.